Photoshop CS6 gives you the ability to add, delete, rearrange and edit layers. Photoshop organizes the layers in the order of your image, for example the bottom layer in the control panel is the bottom layer of your image. When you are editing an image it is useful that when you create a new layer to change the name of the layers so you can quickly and easily find which layer you want to modify. You can change the file name by ‘double clicking’ it’s title then pressing ‘enter’ or clicking away from the layer when you have finished to apply the change. 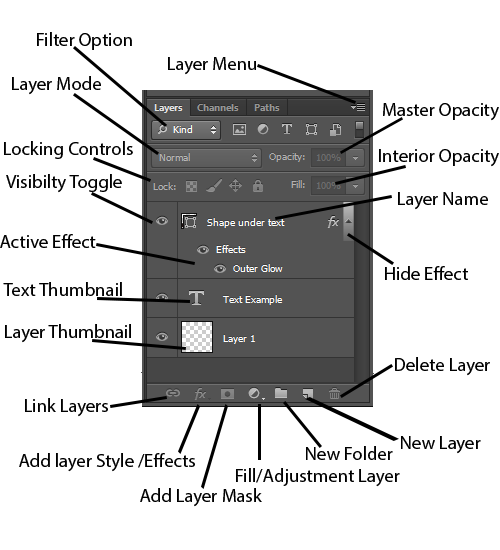 The image below shows the Layer control panel in Photoshop. The image shows you what has already been changed within the layers along with the layer names and postions. This will help you to create any further changes to the image. Within the layer control panel you also have various other options which allows you to; add a new layer, delete a layer, add a folder, disable effects, enable effects, locking the layer, link layers and many other options which are shown below. Understanding each option which allow you to edit pictures alot easier and also improve the quality of the images.